"Step away from the cupcake and nobody will get hurt. . ."
Julia Goodman has an addictive personality that she controls only with the help of her shrink, Dr. Ness, who functions as both her drill sergeant and her conscience. Though she has changed the names to protect the privacy of her friends and family, Julia has immortalized Dr. Ness in her best-selling self-help book, Up in Smoke. She's slated to follow up that title with Food Crazy, which will detail how she has used Dr. Ness's techniques to battle food addiction. Julia's world starts to fall apart when her best friend marries and then moves away, her director husband heads off to LA to work on a project, and Dr. Ness announces that he's moving, too. Julia turns to sugar for comfort and, without Ness's drill-sergeant-style guidance, she starts putting on weight. This makes her sure she will be labeled a fraud when she begins making media appearances to promote Food Crazy. Desperate to maintain her image, she makes appointments to see eight psychologists over the next eight days, hoping that she will be SPEED SHRINKING her way to her replacement mentor. 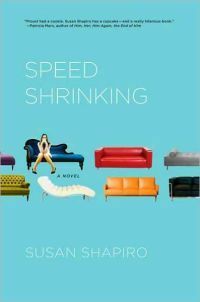 While Shapiro (whose other books include a number of nonfiction self-help guides on addictive behaviors) gives us a protagonist that is laugh-out-loud funny, there is a lot of serious ground covered in this book; from dealing with people who don't see food addiction as a real psychological disorder to the frequent failure of one-size- fits-all programs marketed towards the masses who are trying to loose weight. Anyone who has ever dealt with emotional eating will be able to commiserate with Julia's journey toward self-understanding (and delight in the gentle lampooning of some of the best known weight-loss programs out there). Those who've never been tempted by the call of a cupcake will gain insight into the struggles food addicts face. Everyone will want to cheer Julia on as she tries to understand just what it is she's really hungry for after all. Manhattan self- help author Julia Goodman thinks she�s got her addictive personality under control. Then her beloved psychoanalyst moves away at the same time her husband takes off to L.A. and her best friend gets married and moves to Ohio. Feeling lonely and left out, Julia fills in the void with food, becomes a cupcake addict, and blimps out. This is a huge problem�especially since she�s about to go on national television to plug her hot new self-help book about how she conquered her sugar addiction. Navigating her insurance network, Julia desperately sees eight shrinks in eight days, speed-dating for Dr. Replacement�or any other new guru�to help shrink back her body and anxiety in time for her close-up.